You probably have friends or family who had laser vision correction. You may have talked to your doctor about it or done some research. But you're still dealing with those glasses and contact lenses. Why? 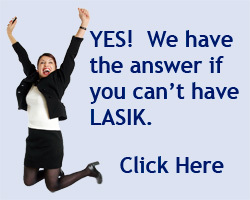 Waiting for a major advancement in laser vision correction? Well, it's here. At Brems Eye Center CustomVue has become the cornerstone of our practice. It's taking laser vision correction to a new level, says Dr. Brems. Imagine the luxury of taking perfect vision for granted. Now, with the Visian ICL, you are finally able to do just that. The Visian ICL is an implantable contact lens that works with the eye to correct vision. Unlike traditional contact lenses that go on the surface of the eye, Visian ICL is surgically inserted into the eye where it provides excellent quality of vision for a wide range of correction needs.